The tonneau-cased Kalpa with its teardrop lugs and Delta-shaped hands is perhaps the case design most characteristically recognised as being from Parmigiani Fleurier. It is also of great sentimental value to Michel Parmigiani; in 1998, the Kalpa was where his first movement, following the idea of ‘shaped movements for shaped watches’, took form courtesy of the Calibre PF110 . To mark its 20th birthday, this year has seen the collection’s revival, with the launch models comprising of the Kalpagraphe Chronomètre, Kalpa Chronor, and Kalpa Hebdomadaire, all with in-house COSC-certified movements that are, as you can see in this post, shaped exactly to the hand-polished 18 carat rose gold 48.2 x 40.4 mm case. These new movements are the Calibres PF362 (automatic with chronograph), PF365 (automatic with chronograph, in solid gold) and PF110 (manual-wind, eight day power reserve. The first two have integrated chronographs, and the third is a tribute to the 1998 movement of the same name. All three are COSC-certified. In today’s post, we are focusing on the chronographs. There are a number of things to note about all of these ‘revival’ pieces, and which they share in common. The tonneau’s curves are slightly more pronounced, the teardrop lugs have not just been resized but are fully integrated into the case, the crown is bigger, and the case backs are now fully opened, to show off the new movement. Dial-wise, the new Kalpas are characterised by different levels of surfaces and finishes (guilloché, snailing and opaline) atop which reside hand-applied faceted indices. 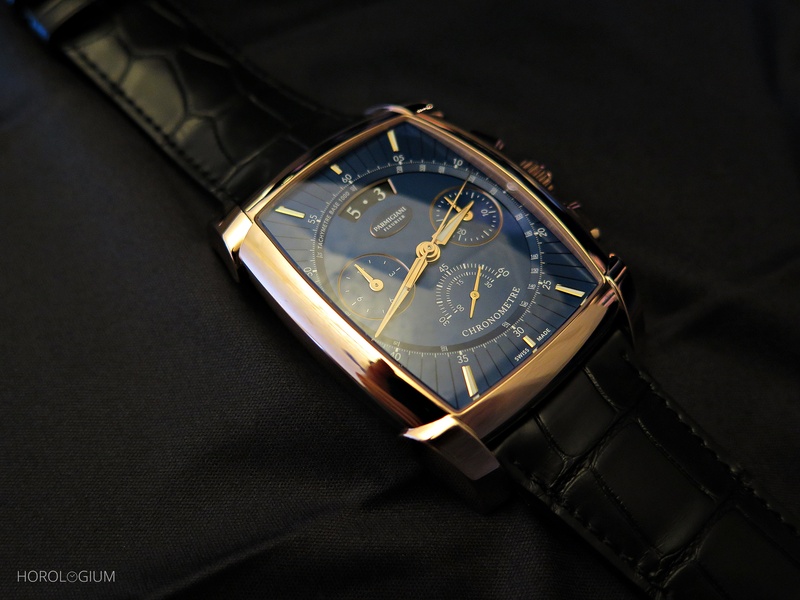 The Parmigiani-styled delta hands have been resized and lumed, and the date window placed at the top of the dial. First up, the Kalpagraphe Chronomètre, with its deep blue multi-layered dial. It features an opaline finish at its centre, surrounded by radiating guilloché, with two snailed counters enclosed and highlighted by gold edging, an angled tachymeter scale, date window, and a small seconds sector with its own hand. As mentioned earlier, it is powered by the automatic Calibre PF362, with an integrated chronograph and vertical clutch. It beats at 36,000VPH and has a sixty-five hour power reserve. Visible through the open case back, you will also note the 22 carat gold oscillating weight with its barley grain guilloché motif. The second new Kalpa chronograph is the limited edition (fifty pieces) ‘Chronor’, which is most noteworthy for being the world’s first solid-gold, self-winding, COSC-certified column wheel integrated chronograph movement – the Calibre PF365. It beats at 36,000 VPH and has sixty-five hours of power reserve. You can enjoy all of this, including the 22 carat gold oscillating weight with its barley grain guilloché, through the large open case back sapphire window. Moving away from the noteworthy movement, the 18 carat gold black-coloured dial has an opaline centre, hand-worked braid-effect guilloché, and snailed counters positioned slightly above the centre of the dial. To say that this is a watch with heft (to hold, let alone wear) is an understatement. Along with the gold of the movement, the case is 48.2 x 40.44mm of hand-polished 18 carat rose gold as well. All the new Parmigiani Fleurier Kalpa models come on Hermès black alligator straps with rose gold folding buckles.